It’s always an immense pleasure to get perspective and insight from an intriguing musician who has been a trailblazer of innovation for decades, and who continues to stay relevant and proactive in the current musical universe. This was most definitely the case when Maximum Ink’s Sal Serio recently got to chat with Andy Powell, band leader of the iconic English rock band Wishbone Ash, who will perform at Turner Hall in Milwaukee, Thursday, September 10. The current Wishbone Ash line-up is comprised of Andy Powell and Muddy Manninen on guitars, Bob Skeat on bass, and Joe Crabtree on drums. MAXIMUM INK: Often there is mention of the twin-lead-guitar-harmony sound in discussions about Wishbone Ash. However, it’s usually Thin Lizzy that get credit for “inventing” that technique. Yet, it occurs to me that Wishbone Ash should really get this honor, since, when you started doing it in 1970, Thin Lizzy only had one guitar player (Eric Bell)! ANDY POWELL: Oh, did they?! I think you’re the first person that’s ever picked up on that! [laughing] Well, that’s very nice of you, and it’s funny that you mentioned Thin Lizzy, because I was at a Steely Dan concert last week, and there’s one song of ours that I know had a big impact on those two bands, because there’s riffs in a song by each of them that could only be inspired by the song “Blowin’ Free”, one of our classics, which, back in the day, would have been played quite a bit on FM radio. I’ve spoken to Scott Gorham, from the later incarnation of Thin Lizzy, and I know that they were influenced by Wishbone because we were the first band that they saw when they came to London from Ireland. So, you know, some people admit the influence and some don’t, but it’s all good to me. Music is like that. We all channel other bands, and music we’ve grown up with, and so it’s a huge compliment. MI: I understand that you believe your early work with bands that had horn arrangements helped to develop that twin guitar sound. AP: Most definitely. Speaking for myself, we were all enamored with the sound we were stumbling on to and creating at the time within the band. But, one of the very first songs that I worked on with my co-guitarist Ted Turner, from the late 60s/early 70s, was the song “Blind Eye”, and we were definitely thinking about producing a piece of music that made the guitars sound like horns, and there’s a little riff in there that runs throughout and just punctuates the song, and really, that’s horn phrasing… brass phrasing. In my teens I was in soul bands, playing songs from the Stax and Motown collection, and you know, I perceived bands at that time as bands with 7 or 8 pieces, and I was often just working as a rhythm guitar player. But I did work a lot with the horn arrangers in those bands, so it was fun to do that, and then just start doing the same thing with the guitars. MI: And of course, your guitar of choice is the Gibson Flying V, and you really have to be comfortable with that style of guitar. AP: Indeed. Yes, most definitely. I think I was looking for a guitar that would be “my” instrument. I’m to that point [where] I’ve made guitars, and I’ve actually played my homemade, home-built, guitars in different bands, and certainly in the first year of Wishbone Ash I used a homemade guitar. But, I was playing a Gibson SG, which is a much more manageable guitar, but very similar in construction to the Flying V… the Honduras mahogany, one piece body, same scale… but, when I stumbled on the Flying V, people just hadn’t picked up on that guitar, because it was seen as Gibson’s attempt to be “futuristic”. I think it was a little bit too [much] before it’s time. And then of course, as you mentioned, it’s very much a performance guitar. You don’t sit down with that guitar! [laughing] I think a lot of players felt, well, I prefer a Les Paul or something [that] I can put on my knee. But, when I played this one, it was a 1967 [model that] had been sitting in a packing case. It was in a store in London. This was 1972, when I picked it up, so it was already five years old, but brand new. I picked the guitar up, and curiously, I noticed, as a guitar maker, that the “fins” on the guitar actually helped with the resonance. For a Gibson it was very resonant. A lot of Gibsons have that muted, soft, tonal, body kind of sound. But the Flying V had a lot more resonance, and that suited my style very, very, much. I immediately bonded with the thing, and have loved it ever since. 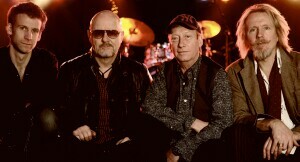 MI: The current Wishbone Ash line-up has been together now longer than any other previous line-up. MI: Now that enough time has gone by with this group of guys, and you’ve developed your chemistry, do you feel there’s an unspoken understanding and consciousness to your performances, like, you all sort of innately know and anticipate where the other player is going to go? AP: Well, that definitely does happen in bands. If you think about it, when you’re on the road… and we’re on the road for at least half the year, 150-200 dates a year… you’re living together. You’re interacting personality-wise with each other. And certainly stylistically, you’re really aware of people’s strengths and limitations a lot. So, you’re playing with all of that in mind. As you say, there becomes a lot of inherent ability to play to your strengths, and I think you’re absolutely right, that does happen with us, both in the construction of new music, and in terms of when we’re jamming on stage, and we’re improvising and trying to push the envelope a little. MI: With as long of a career as you personally have had in music, what do you think still motivates and drives you to keep going? AP: Fun! [laughing] You know, it’s a big joke in the music business, “I got in to this business because it was better than working for a living”. Well, the reality is, it can be very hard work, but it’s got to be fun, and it’s got to be passionate. Because if the musician in the band doesn’t have passion and fun about it, [then] how can you expect the audience to feel that way? A band needs to be inspired [about] their music in order to inspire an audience, and I think that’s very important. This band does that, and that’s not always [been] the case with different incarnations of [Wishbone Ash]. Some have been fun, some have been hard work, and some have been just downright miserable. I think that’s true of any band, you have your good years and your bad years, but as you mature, get older, and become wiser, hopefully you end up in a phase where you’re feeling pretty good about yourself, and it’s fun. MI: In the early Wishbone Ash songs, I hear a lot of the 60s/70s English folk style, especially in the vocal arrangements, and I also noticed that you were somewhat influenced by Richard Thompson. AP: Yeah, definitely. For me, 1967 was a year of flowering, you know, in terms just discovering music. I was going around to a lot of music festivals at the time. Music festivals themselves were a brand new experience. When you’re 17, 18, years of age, you’re very open to influences, and one of the first bands I saw, just travelling around on the road, was Fairport Convention. That really resonated with me, because it was music that had depth. In other words, it was rooted in British folk, and here I was playing this very futuristic looking guitar, but being influenced by Ye Olde England! [laughing] And Richard, as a guitar player, was just a very lyrical, fluid, player. Yeah, I absolutely can not deny that he was a big influence, for sure. MI: The Fairport vocal sound really seemed to transfer over to Wishbone Ash. AP: Yeah, it’s that sort of modal type of harmony that embody songs like “Errors Of My Way” and some of the material from the ‘Argus’ album. Another thing that is not to be overlooked, certainly in the construction of some of the songs, and rhythmically, we were definitely influenced by Dave Mattacks, the drummer of Fairport Convention… his free kind of angular, wooden, type of drum style. Like, a lot of the American drummers were really pushing the beat. They’re accenting a lot. And this was unique to me, that a drummer could play folk music, folk rock, and really enhance it in a way that was a very English style. Certainly we employed some of his technique and style in to the construction and arrangement of some of the drum parts in [our] early music. So, [with] Fairport, yeah, I hadn’t really thought about it before, in terms of the vocals, but I think you’re absolutely right. They were probably more of an influence on us than I had thought. I certainly had met Richard Thompson, and I’ve told him that. Bands from our period of time, were free to be influenced and mix styles a lot. MI: The term “progressive” has often been used to describe the music of Wishbone Ash, and you’ve also stated in interviews that you consider the roots of Wishbone Ash to be sort of a “jam band”. Of course, both these terms get used quite a bit with the younger concert-going crowd. I wonder whether that audience is seeking out the originators. Is the younger music audience finding out about Wishbone Ash? AP: That’s a very good question, actually. I’ve seen a couple of jam bands in concert, and I’m a big fan of Umphrey’s McGee, and I’ve told them that. They immediately got back to me by email once, and actually said, “we’ve all listened to Wishbone Ash – we love it”. Younger audiences… and I’ve been in the audience to see other bands in that genre, are seeing people of their generation that they think have some kind of link, or passion, back to the bands when times seemed freer. The 60s, for example, was a very free time. It was really up to the bands to tell the record labels what kind of music they were making, because the record labels didn’t understand half the time! I think that’s what the younger audiences and the younger bands in the jam genre are channeling, and I think it’s a feeling of verity. They don’t want anything that smacks of corporate this [and that], they want something that seems to be produced by people that do it from the heart. I think a lot of 60s and 70s bands were like that. It was a counterculture. There was a feeling of change in the air. There was a new youth movement that was really starting to call the shots… post-war baby boomer, call it whatever you want. It took a while for the “suits”, the people in the industry, to catch up and pick up on all of that. Plus of course, you also had this whole thing with FM radio, and so consequently I think that there is a yearning in younger bands and audiences to get back to that kind of zeitgeist. MI: Your September 10th concert is in Milwaukee, and of course the Midwest is a very free and open music market, which at the same time has a friendly attitude towards the classic rockers. Do you find a different vibe playing in different parts of the United States… and, how do European audiences differ from us Americans? AP: I think it’s very difficult to talk about the United States in one breath. You know, you’ve got the West coast “cool”, the New England reserved-ness, the Texan… you know, the one thing that’s the common thread for us is the guitar [fans]. Certainly the Midwesterners love their guitar, and it’s the same thing down in Texas. If you’re a guitar band and you channel the blues, you’re going to be okay, you know. I think it gets back again to that kind of honesty. The blues is perceived to be an honest music. It’s not just restricted by geographical limitations. We’re finding increasingly now in Europe [that] there’s been a huge blues boom. In fact there are certain American artists that only exist because they are existing in Europe! You know, they have their roots in America, but they tour and make their living in Europe, playing American music. Americana, blues, jazz, American bluegrass, folk, you name it. There’s a huge interest in music that has that kind of verity about it. Maybe it’s the Internet, social media, or communications in general, but I’m finding now that people are far more open in different cultures, different parts of the States, to be a fan of a certain genre of music. You could be in Helsinki, Finland, you could be in Moscow, you could be in Austin, Texas, or you could be in Tokyo. Providing you know about all the language of music, and you understand the lifestyle, then, that’s the culture of that, and people understand and get that. In a way, the cool thing about the Internet is that it’s breaking down those geographical boundaries. There are amazing experts in Southern blues in Helsinki. We tour Germany once a year, [and] you generally could say the market is quite close to the Midwest, in terms of it’s love for classic rock, as you’ve defined it. I think there are similarities there. For example, in the Midlands, the heartland of England, they love classic rock, and you could say that the heartland of America is the Midwest. There are parallels and there are similarities, so basically we just go wherever we are welcome. It doesn’t matter where it is. We just played a tour of South Africa. We played about a half dozen shows there in pretty big venues, and you could have been in Des Moines! It was a classic rock crowd, beer drinking, a good love of guitar rock, blues, that’s what they were in to. You could have transplanted the audiences we were playing [to] down there, in to a venue in the Midwest, Milwaukee [or] somewhere like that, and [they] would have been completely at home. MI: Your most recent studio album is ‘Blue Horizon’ (2014), but it looks like you had just a few months ago done a live recording that went straight to vinyl. AP: Yeah, it’s yet to be released. The first recipients are going to be the 150 fans that were invited to be at the recording, and then there will be a limited edition of those vinyl pressings available on the general market. There’s a lot of renewed interest in vinyl again now, so, it was a fun thing to do. We’ve been doing a few things like that this year. Because, in the absence of a new studio album, it is time to do some live recordings, [also] I have a book coming out soon… things of that nature. So, that’s one of the things that will be on release in the Fall. MI: I believe there is also a new live DVD coming out. AP: There is, indeed, recorded in Paris earlier this year. That’s being mixed and edited as we speak. That should be a good long recording of the band live in concert. MI: How was the experience writing the autobiography (“Eyes Wide Open: True Tales of a Wishbone Ash Warrior”)? You seem comfortable recounting your history, and have an excellent memory. AP: [laughing] I’ll have to work on the memory! Because I think at least ten years are missing… the 70s, right!? Writing a book is a first for me. I’ve always done blogs and things on our website, and I do enjoy interviewing. I enjoy learning lessons from the career, and looking at it. It’s a long career, so I’d be remiss if I didn’t muse about it, and try to philosophize about it in some way, shape, or form. But, in terms of “writing” the book, it was like the worst school homework assignment I’ve ever had. [both laughing] It was not to be undertaken lightly! I’ve learned an enormous amount of lessons writing this book. The work was undertaken with a co-writer. There were so many decades to cover, that I needed a co-writer to prompt me, and we kicked off with a set of interviews. It was based in Ireland. So, every time I was heading to Europe I’d stop off in Ireland, we’d sit down over a few pints, and just spiel. We then worked on finessing it, and I worked on editing it, and then adding in quite a few chapters in addition to the interviews. Colin Harper, my co-writer, is quite an expert. He’s written books on John McLaughlin, [and] on English folk, interestingly enough. He’s also a writer in his own right, and he’s a great expert on culture, especially British culture from the 50s and 60s. So, we tried to contextualize a lot of the stuff that happened to Wishbone Ash back in the day, within these little vignettes of what was going on at the time elsewhere. You caught me on a good day… I’m actually delivering the book today. It’s been edited, worked on, and finessed, and we’re ready to go with it, so it’s really an exciting day for me. It’s been very daunting, but also very exciting, and hugely meaningful. MI: What are the release dates? AP: Well, we’re pushing for the DVD to come out at some point on the U.S. tour, hopefully in time for the dates in your area. The book will come out ready for the U.K. tour, which is directly following on from the American tour in the month of October. So, both releases are imminent. MI: Recently I had picked up the ‘Argus’ album reissue on CD that has the ‘Live In Memphis’ E.P. tacked on to the end of it. I really enjoy both bodies of work, but I wasn’t lucky enough to have the ‘Live In Memphis’ material when it was on vinyl. Is it just those 3 songs, or was there more? AP: I think there was more to it [but] I’m not sure. There wasn’t very many songs. We probably recorded more material on the actual [radio] show, but I know that vinyl was produced as a promotional tool to send out to educate, and make aware, the radio stations to this new band. It was either 3 or 5 tracks, I’m really not sure. It’s a good question, I should double-check that. MI: In conclusion, is there anything you’d like to say to your Midwest fans? What should we expect at your Turner Hall show on September 10th? MI: Excellent. Well, I happen to like the new material, so you won’t bore me when you play those songs! AP: That’s very cool! Thank you so much. We do pride ourselves on that. We put a lot of work, effort, and heart in to that music over the last 15 years or so. There’s a big body of work now from recent times. Very nice, Sal, and we do appreciate the help.